Sydney, Australia – November 20, 2013 – Altium Limited, a global leader in Smart System Design Automation and provider of solutions for 3D PCB design (Altium Designer) and embedded software development (TASKING), has released PCB design content for Altium Designer users supporting the FTDI FT800 family of HMI solutions. The FT800 family, with its revolutionary EVE (Embedded Video Engine) Technology, combines display, audio and touch in a single chip. This optimized solution reduces board area, power and BOM requirements, making it a leading solution for Human Machine Interface (HMI). 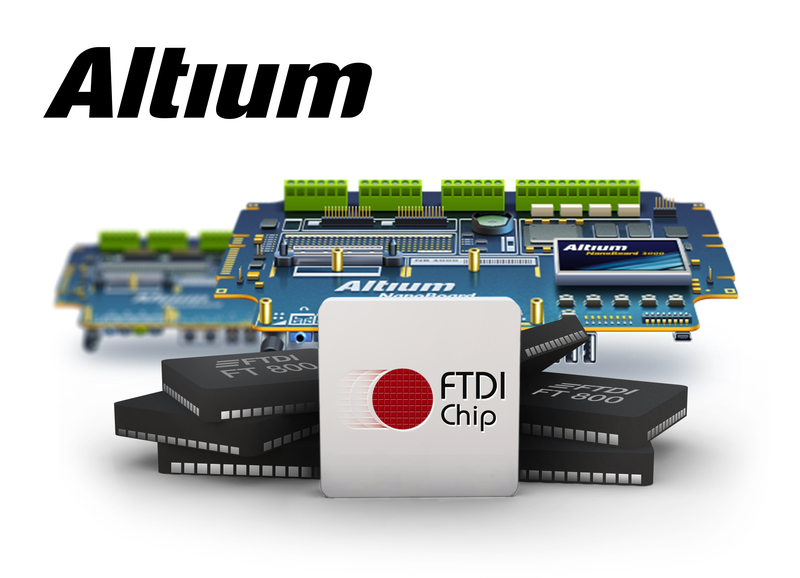 By releasing board design content to support the FTDI FT800 family, Altium eliminates the need for engineers to spend time developing and validating PCB footprints, schematic symbols and 3D component bodies for the FTDI components. The content release includes live supply chain solutions providing an accurate picture of overall project BOM cost, and assisting in sourcing the components quickly. With the need to keep up with ever reducing design cycle times, Altium Designer subscriber customers enjoy access to Altium’s extensive Content Vault which includes board design support for more than 140,000 components from vendors such as Linear Technology, Analog Devices, Texas Instruments, Microchip, Maxim and more. FT800, Embedded Video Engine HMI Solutions. FT-X, Low power, low pin count, Full Speed USB interface bridges. FT12, USB Full Speed Device Contollers. Vinculum Family, USB Host / Slave Controllers. FT300, USB Host / Android Open Accessory (AOA) Solutions. FT Series, USB Slave Controllers. More information on board-level components and how they are accessed in Altium Designer is available from AltiumLive and in the related blogs. All components are available from FTDI Chip and its global sales network. For more information, go to www.ftdichip.com. FTDI Chip (www.ftdichip.com) specialises in the design and delivery of advanced silicon and software solutions. The company focuses on providing engineers with feature-rich, easy to use, robust products that will speed to market and reduce development costs. Widely recognised for its broad portfolio of Universal Serial Bus (USB) products, FTDI Chip can offer a simple route to USB migration by combining easy-to-implement ICs with proven, ready-to-use, royalty-free firmware and driver software. It has everything from simple bridge devices for converting USB from RS232, RS422, RS485, I2C, SPI, etc, to highly integrated system solutions with built in microcontrollers and sophisticated development platforms.